According to Guinness World Records, Robby Steen, Carson Steen and Rick Steen are now the creators and driver of the world’s fastest golf cart. Coming in at an amazing 191km per hour! (118.76 mph) Even at that speed that’s not good enough for the Plum Quick Golf Cart Repair Shop. Discovery Channel’s Daily Planet goes along as Robby Steen makes some last-minute tune-ups before speeding to break his own world record. 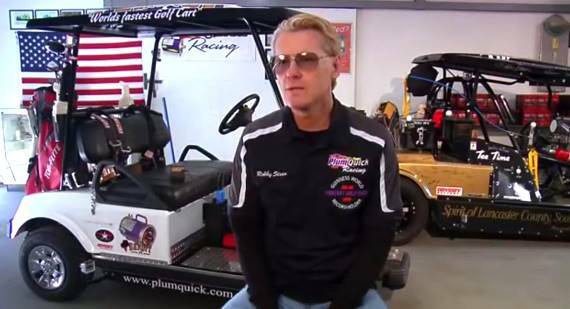 Officially recognized by the Guinness world record website as the fastest golf cart is the ‘Bandit’ by Plum Quick Motors in Fort Mill SC. The golf cart achieved a speed of 191.12 km/h (118.76 mph) when driven by Robby Steen at the Darlington Dragway in Hartsville, South Carolina, USA, on the 31st of October 2014.